* There is some skine flakes on the material that should wash right out. 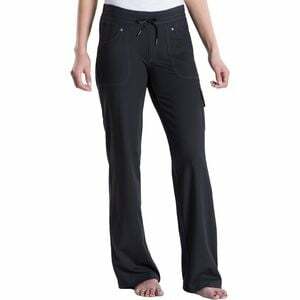 Get outside and get movin' up trail with the Kuhl Mova Women's Pant. Made with soft stretch fabric, a faux fly, and an internal waist drawcord, this pant is lightweight, durable and comfy, making it perfect for hiking to the lake or kicking back on a sun-dappled porch. The contoured waistband provides a comfortable fit for lounging or exploring, and the Mova sports six pockets for trail booty or snacks.